Argentina did not start its import-substituting industrialization (ISI) process in the postwar years, nor were efforts in this direction initially undertaken under the influence of conventional import-substitution policies and tariff protection. Studies carried out by Villanueva (1972), Schvarzer (1996) and other Argentine scholars show that the industrial expansion of the period 1930–44 (Table 10.1) was by no means a major departure from previously established trends. In this respect Villanueva writes: ‘Industrialization takes off well before the 1930s… In 1935 as much as 78 per cent of industrial output was produced by firms which were already in operation before 1930’. Moreover between 1924 and 1930 industrial investment and imports of machinery and equipment grew quite significantly, particularly so in sectors such as chemicals, pharmaceuticals, foodstuffs and electrical equipment. The new plants coming on-stream in such sectors add up to a rather large number of meatpacking houses, sugar mills, tanning firms and so on, already active in Argentina since the early days of the century. 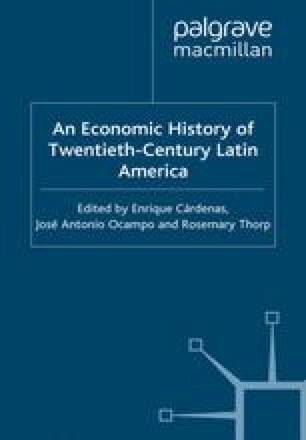 Both authors belong to the Economic Commission for Latin America and the Caribbean. The ideas presented here are our exclusive responsibility.